L /C is an undertaking given by a Bank on behalf of its customer to pay a certain sum of money to a certain person ( Beneficiary ) on the fulfillment of certain terms and conditions as laid down in the letter of credit. Or-It is an instrument issued by a Bank undertaking the payment on the fulfillment of certain terms and conditions as laid down in that letter of credit addressed to a beneficiary. To be more precise, L / C is nothing but giving advances ( Investment ) to the customers. Where there is no reference to the attachment of some papers / documents under an L / C it is called clean / Open L / C.
If the presentation of specified documents is obligatory / mandatory then the credit is called a documentary L/C. In practice, the Bankers deal with the documentary credits. L / C may broadly be divided in to two – (a) Revocable L / C & (b) Irrevocable L /C. It is that type of L / C which may be revoked / cancelled at any moment. There is no existence of this type of L/C in the World. According to UCPDC, a revocable credit L/C may be amended or cancelled by the issuing bank at any moment and without prior notice to the beneficiary before shipment of consignment against the L/C. Irrevocable L/C: The L/C which cannot be revoked/cancelled/amended without the consent of all the parties involved in a letter of credit is called irrevocable L/C. Unconfirmed L/C : The L/C which is not add-confirmed by the 3rd Bank, it is called Unconfirmed L/C. Acceptance Credit (Credit covering time drafts) : In case of acceptance credit the exporter draws a time draft either on the issuing bank or on the importer or on another bank depending upon the credit terms. The payment date may be for example 90 days after the invoice date or the date of the transport document. When the documents have presented the drafts is accepted by the drawee for payment upon maturity in terms of credit. Deferred Payment Credit : The deferred payment credit differs only slightly from the acceptance credit in its effect on the beneficiary. The main difference is the lack of a draft. Upon presentation of the proper documents the bank so authorized (the issuing or confirming bank) issues a written promise to make payment on the due date). Opener: The applicant of L/C or the Importer / Buyer / L/C applicant. Opening Bank: The Bank opening the L/C i.e. the importer’s Bank / Buyer’s Bank. Advising / Notifying Bank: The bank advising the credit to the beneficiary. Beneficiary / Export / Seller : The exporter/supplier in favour of which the credit is opened/issued. Negotiating Bank : The Bank who negotiates/purchases documents of the exporter against the L/C opened and presents the documents to L/C opening Bank for payment. Reimbursing Bank : The Bank who makes payment to the beneficiary’s Bank (BBK) on behalf of or at the request of opening Bank on receipt of confirmation regarding compliance of credit terms from negotiating bank. Transferring Bank: In addition to the above, there may be another bank which may be termed as confirming Bank. CLASSIFICATION OF L / Chow does a letter of credit workletter of credit exampleletter of credit formatletter of credit in indialetter of credit pdfletter of credit processletter of credit vs bank guaranteePARTIES TO A LETTER OF CREDITTypestypes of letter of creditWhat is Letter of Credit -www.bankallinfo.orgWhat is Letter of Credit (L/C)? 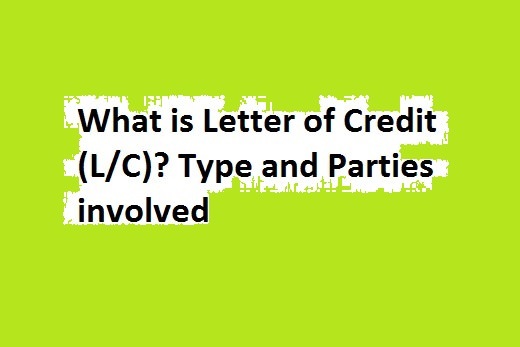 Type and Parties involvedWhat is Letter of Credit (L/C)? Type and PartyWHAT IS LETTER OF CREDIT?